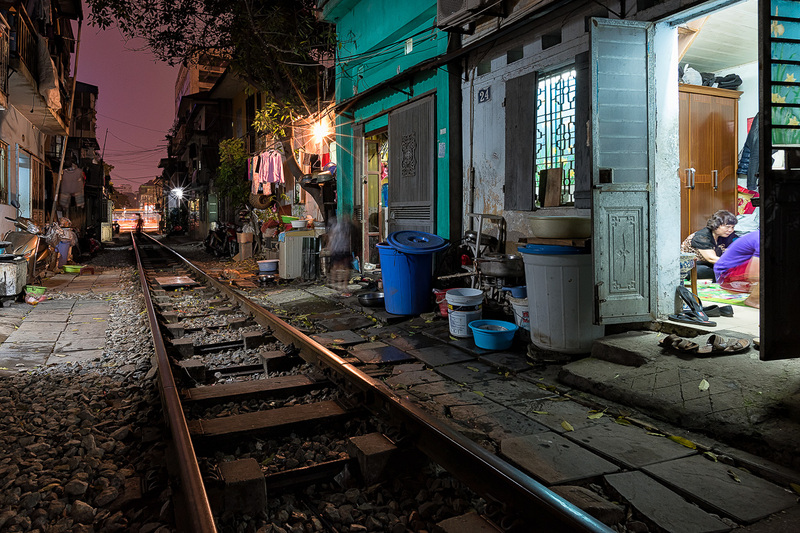 It might not be a big surprise that locals from Hanoi are using every single square meter, but the way how they use the train tracks in front of their houses is quiet stunning. The train tracks really became an additional space for living. 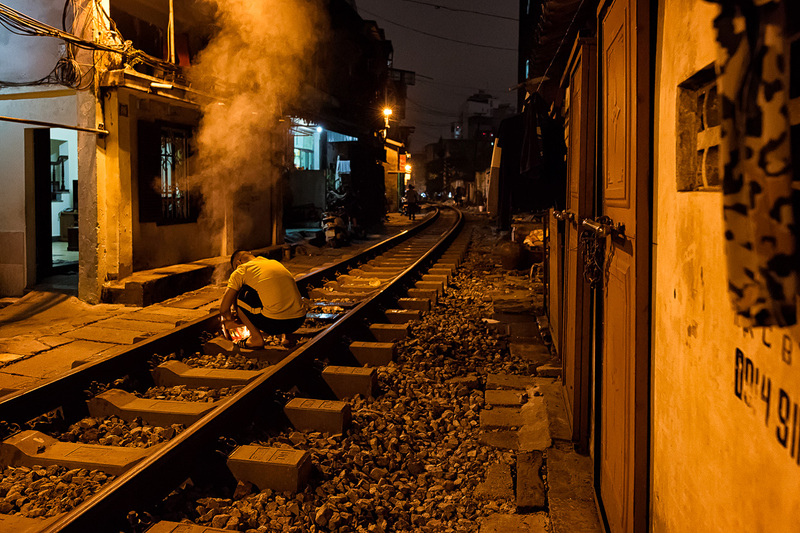 There are people cooking, eating, playing or washing dishes right on the railway. 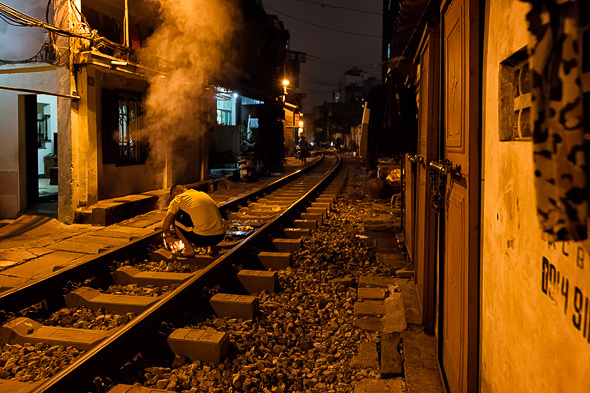 A woman burnt her daily waste just before the train passed through. Chickens were running around, and Children were playing and had great fun jumping from one track to the other. The train arrived with a delay of about an hour. Not all people seemed to be happy to see me standing with the camera next to the tracks. 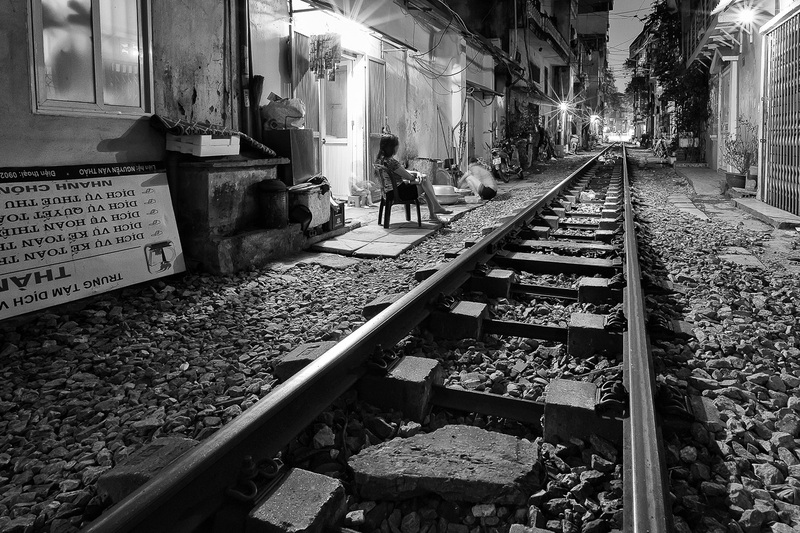 It felt kind of strange to me standing there, because next to the tracks is actually the place where they live. I saw people who had to cross the tracks to get to their bathroom. I wished I could speak some words of vietnamese to have a chat with them. WHAT INSPIRED YOU TO TAKE PICTURES OF THIS STREET? HOW DID YOU FIND OUT OF ITS EXISTENCE? Before visiting a city for the first time, I always try to learn about the exciting spots. The most famous places are usually quite easy to find, but those are normally not the most spectacular ones. 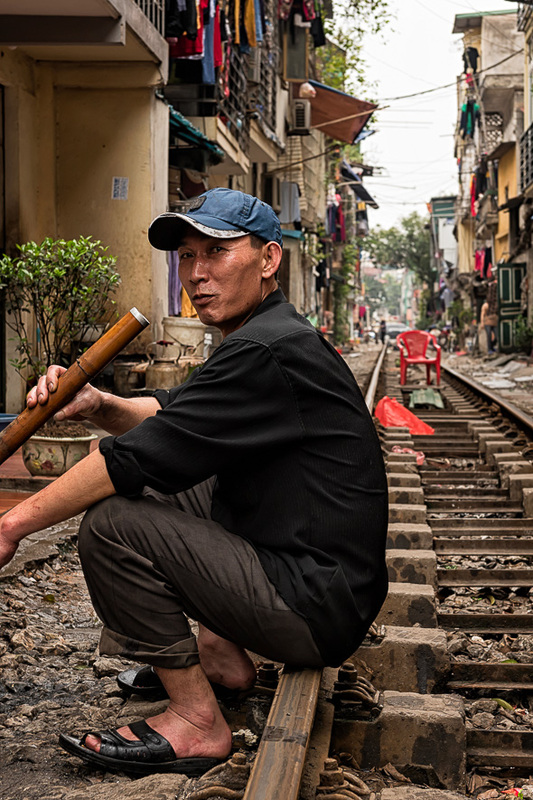 Hanoi is one of the best places for street photography. 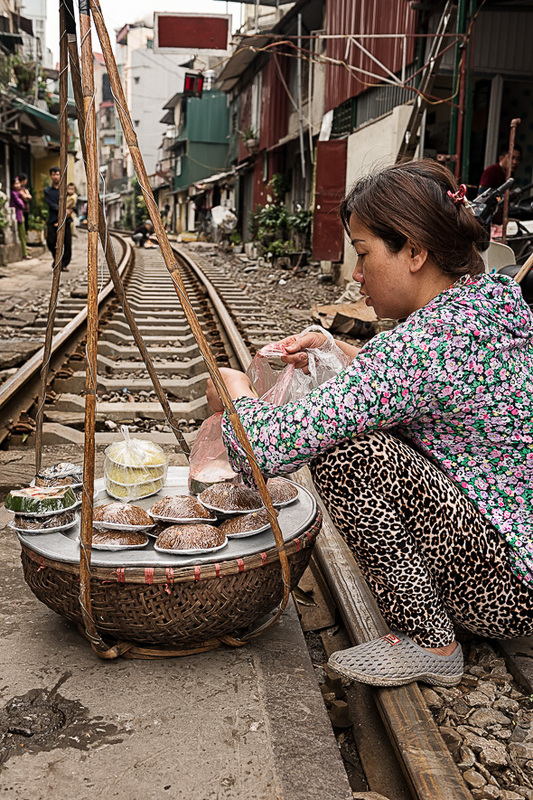 There are many photo blogs and photo gallery websites where you find inspiration, and this is where I first saw a picture of this amazing scene in the old quarter of Hanoi. When you look up the railway track on the city map you’ll notice that there are not that many crossings, so I checked out those places. The bigger challenge was to find out when the train is passing through this area. I couldn’t ask the local people because they weren’t speaking english. 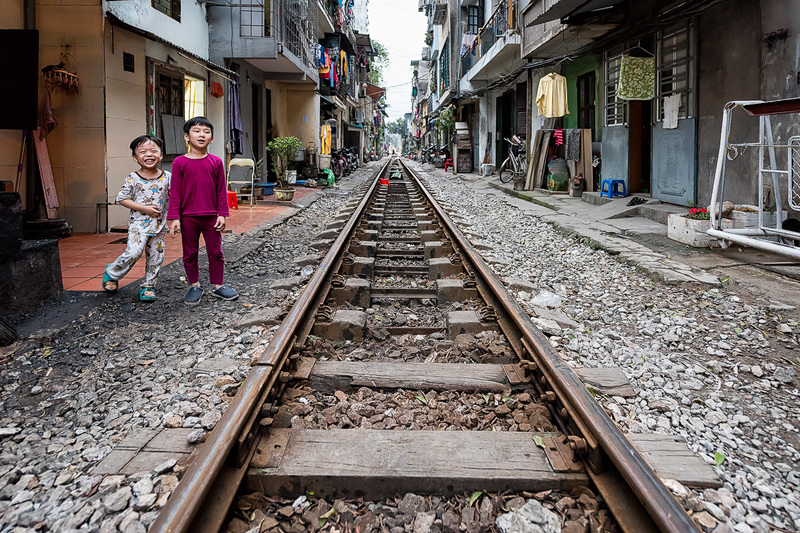 Finally, I found a local photography tour agency (Vietnam in focus), and of course they knew this place and the time table of the crossing trains very well. 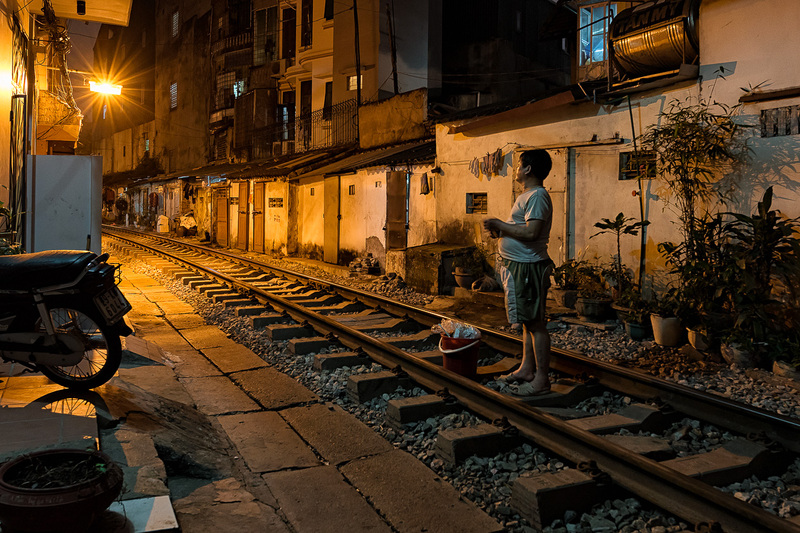 WHAT WAS THE EXPERIENCE LIKE PHOTOGRAPHING THE STREET AND THE PEOPLE THAT LIVE NEAR IT? I visited this place at least four times (during day and night) and I made different experiences. Especially older people were not really happy to have a photographer next to their homes. I spent a lot of time there and many people gave me a wave as a sign to leave. 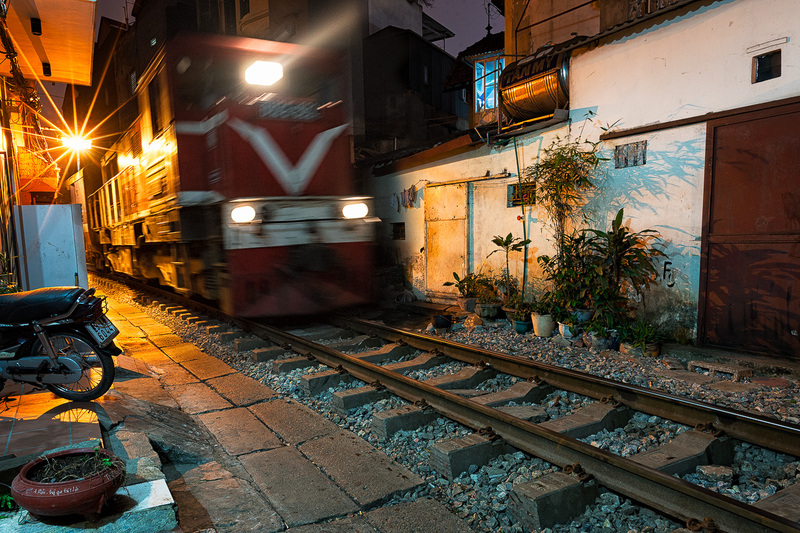 On the first night I was waiting for the approaching train and it took about an hour until it finally passed. No one really knows how much delay these trains have. 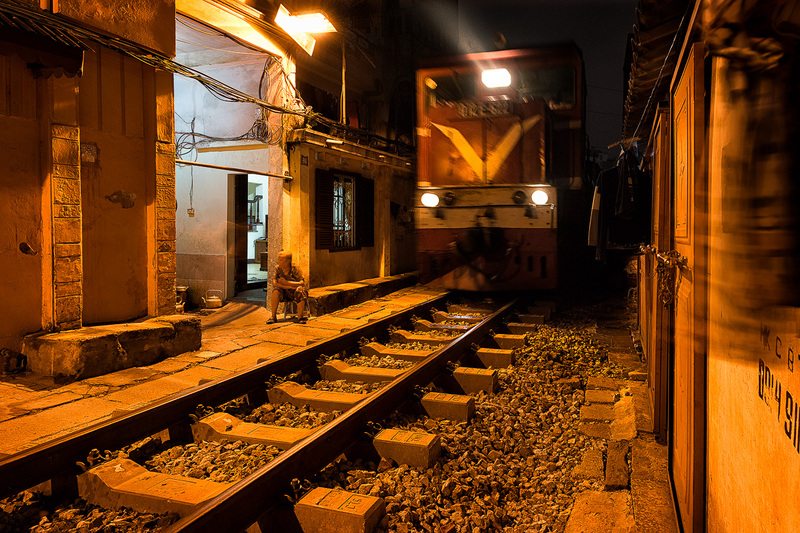 I think most people didn’t understand why I was waiting there with my tripod and camera for such a long time, just for taking a picture of a train. FROM YOUR OBSERVATION DID IT LOOK LIKE THE PEOPLE WERE COMFORTABLE HAVING A TRAIN TRACK RIGHT OUTSIDE THEIR FRONT DOOR? 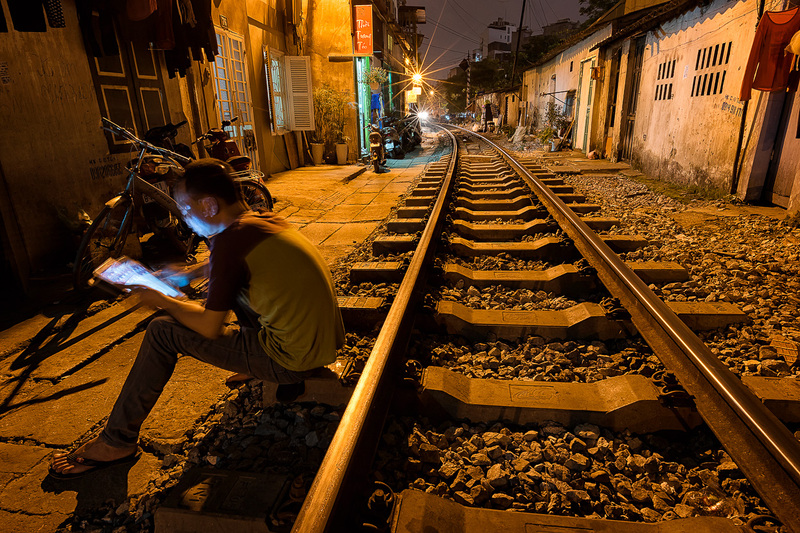 DO PEOPLE TEND TO STAY ON THE TRACKS OR AVOID IT? WHAT IS LIFE LIKE FOR THEM? 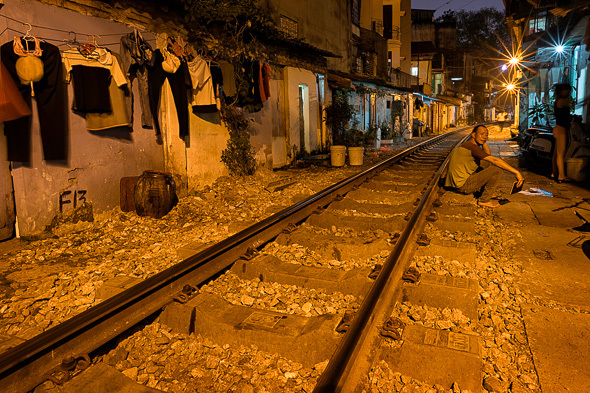 People are living not really next to the track, they live with the track. When I was waiting for the train I saw many people who had to cross the track to get to their bathroom. It did look as if those people were happy with this additional space they can use. I think for them this is still better than having a busy street with cars and bikes in front of their house. HOW OFTEN DOES THE TRAIN COME DOWN THAT TRACK? HOW DO THEY KEEP THEMSELVES SAFE? The train passes only twice a day. Before the train approaches, people have to move their stuff out of the way. 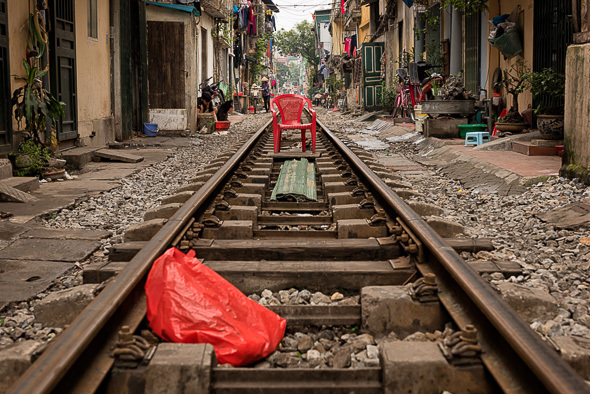 Especially bikes are standing very close to the tracks, as well as clothes and chairs. The train was honking a couple of times before it approached. HOW DID THE PEOPLE REACT TO YOU PHOTOGRAPHING THEM? 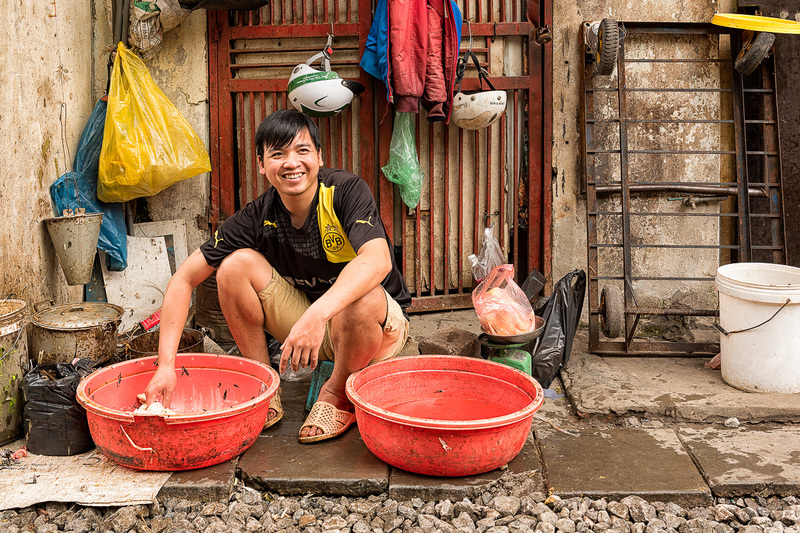 Because I couldn’t speak vietnamese I just showed them my camera and hoped to get „the permission“ for taking a picture with the help of a friendly smile. But not all people were happy and some of them gave me a wave for telling me to go away. WHAT WAS IT LIKE FOR YOU WHEN YOU WERE TAKING THE PICTURES? WHAT TYPES OF EMOTIONS DID YOU FEEL? It was special in many ways. The doors of these people’s homes are usually open and so you get quite a good impression of how they live. There is not much privacy, so as a stranger you feel a bit like an intruder in their private life. A very nice experience have been the playing kids who were jumping around on the tracks. After a while they came to me and wanted to see the pictures on the camera display. They were laughing and excited about this strange foreign visitor with his camera. 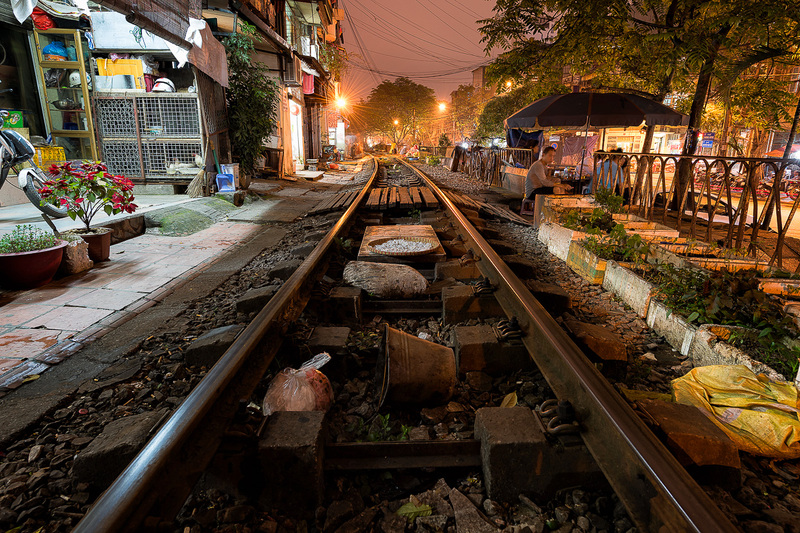 HOW LONG DID IT TAKE YOU TO PHOTOGRAPH THE TRAIN TRACKS? WAS IT DIFFICULT TO CAPTURE PEOPLE LIVING THEIR DAILY LIVES ON THE TRAIN TRACK? Street photography is always a challenge in many ways. You often can’t anticipate what happens next and sometimes you have a specific scene in your mind and then you wait until it occurs. On the other hand, you often have to be very quick and take your picture before a special occasion has already passed and you have missed the best moment for a great picture. It has been a very challenging but absolutely fascinating experience!